The German Alpine Corps, established in May 1915 as the first major German mountain unit, fought until 1918 on several fronts. Initiated mostly based on the purpose of its creation - to fight in the mountains - it went from one to the other based on strategic priorities. The multiple journeys it carried out throughout Europe and many theaters of operation where it was engaged derived its reputation for being an elite unit. Their adaptability and offensive potential occasionally enabled them to be used outside of their usual employment framework, which is why they sometimes appeared on the Western Front. In particular, its name is associated with the final German attempts on the right bank of the Meuse in 1916: it experienced quite a hassle, and before Verdun, in three months, their losses exceeded the initial number of their workforce. 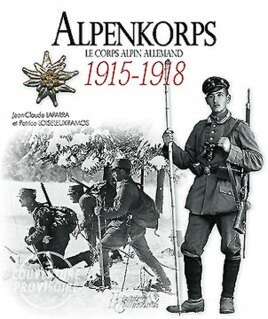 This book, written from original sources, is richly illustrated with photos that belonged to the officers of this unit, including photos from the commander of the Alpine Corps himself.